H&H Stone was established in 2013 when owner Dave Hamman and a partner purchased the limestone quarry in Bolingbrook and a sand and gravel pit in Boone County, IL. They took delivery of the first Sandstorm 620 wash plant in the USA following its debut at CONEXPO/CON-AGG 2017 in Las Vegas. 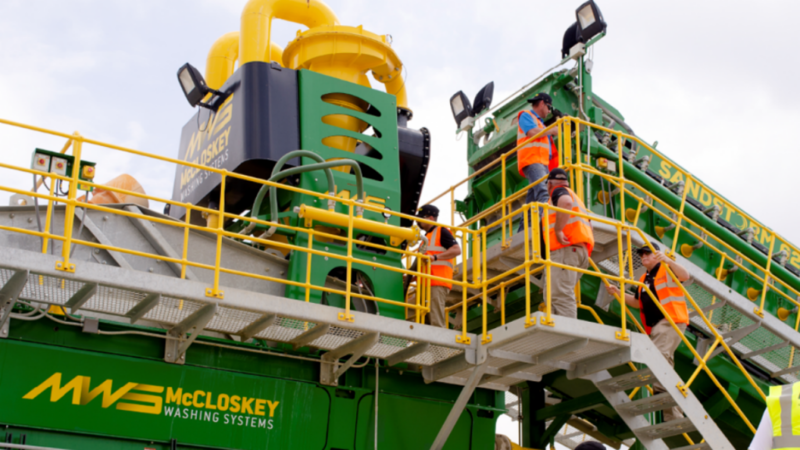 McCloskey Washing Systems hosted a live working demonstration of the Sandstorm 620, processing limestone secondary crusher screenings to produce three-spec concrete/asphalt aggregates and one-spec concrete sand product. The product from the Bolingbrook plant is sold to ready-mix companies and precast companies. The ready-mix companies use it for foundations in homes and driveways while the precast companies use it to manufacture precast panels for distribution building and concrete precast buildings. The sand plant also has the capability to blend all or some of the fine sand into the coarse sand to maximize the required grading. Sean Loughran, Director, McCloskey Washing Systems noted that, "The initial interest in the open day was phenomenal, and we quickly realized that we were going to have to spread the event over two days to accommodate all those who wanted to attend." As the first wash plant from MWS in the USA, the Sandstorm's installation was managed and closely monitored by US Equipment, the MWS dealer for the state of Illinois. US Equipment is a leading provider of material processing & handling equipment in the area, specializing in the construction and aggregates industries. Simon Bradley, Owner of US Equipment added, "H&H Stone's Sandstorm 620 received lots of positive feedback, with visitors impressed by its innovative compact size, while providing maximum access to serviceable areas and producing high quality product. The tours impressed upon the visitors the attention to detail and pride that everyone at McCloskey takes in what they do." Craig Rautiola, Technical Sales & Applications Manager-North America for MWS, noted "the Sandstorm modular range is revolutionizing the wash plant market by introducing innovative solutions. The team at MWS invest a significant amount of time on product development and have teamed up with key suppliers to bring new technologies to the washing industry." Sean Loughran expressed his delight for the numbers that attended. "It is great to see so many people taking time out of their schedules during the busiest time of year to see what MWS can offer. We have invested heavily in our new washing equipment over the past year and it is exciting to show this equipment working efficiently in its true working environment. We extend our sincere thanks to all at H&H Stone and to everyone who joined us."